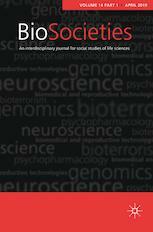 The first journal of its kind, BioSocieties publishes articles, response pieces, book reviews, and self-standing editorials that span the social science disciplines, and present a lively and balanced array of perspectives on controversial issues. The journal breaks disciplinary boundaries within the social sciences and humanities, and between these disciplines and the natural sciences, to develop new ways of thinking about the relations between the life sciences and society. International in scope, the journal examines new research and developments in all corners of the globe. Demonstrating the constructive potential of interdisciplinary dialogue and debate across the social and natural sciences, this is the journal of choice not only for social scientists, but also for life scientists interested in the larger social, ethical and policy implications of their work. BioSocieties provides a crucial forum in which the most rigorous social research and critical analysis of contemporary issues can intersect with the work of leading scientists, social researchers, clinicians, regulators and other stakeholders.